Gabrielle Hoad surveys highlights from the first six weeks of the British Art Show fringe in Plymouth – and considers its legacy. By describing their project as ‘artist driven’, rather than ‘artist led’, Come to Ours offer an important clue to the state of contemporary visual art in Plymouth. Making a mark on behalf of regional art and artists during British Art Show 7 (BAS7) has required more than gentle steering. 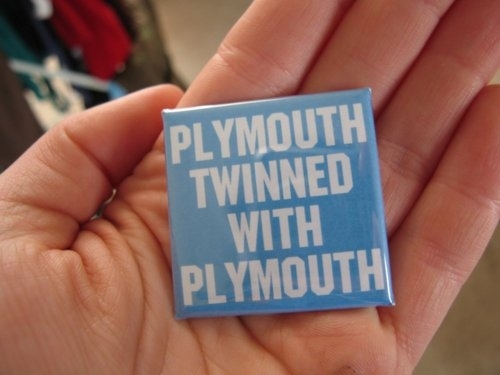 Created by a group of independent Plymouth artists, Come to Ours is an umbrella organisation for six fringe events (The Fireplace Gallery, A Circle, The Library of Independent Exchange, Video Takeaway, Plymouth Aural Survey and Would you like this badge?). Along with Vessel at 22 George Place, they’ve presented some of the strongest ideas-based art to be seen in Plymouth during the early weeks of BAS7. The quality, quantity and diversity of the work within these projects is particularly remarkable when you consider just how few people were involved in organising them. Plymouth’s visual arts scene (and its network of connections) is still very compact. That means it is also fragile, especially as the wider Plymouth public has proved itself wary of contemporary fine art. Invigilators in venues across the city report that BAS7 has been hard for the people of Plymouth to accept. So where does that leave the Plymouth BAS7 Fringe? By definition, the fringe should be peripheral and unconventional. Perhaps the true alternative to bears made of canvas, vomiting heads and stuffed tights is a show of some colourful, abstract paintings? Martin Bush’s studio-come-gallery at the Royal William Yard, just a stone’s throw from one of the five official BAS7 venues, has indeed provided welcome relief for many confused visitors in search of something familiar. 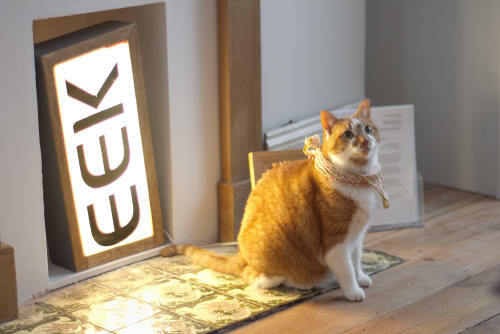 This gallery specialises in art you can hang on the office wall or over the mantelpiece. However, if it’s the familiar and the domestic people want, I’d recommend Richard Dedomenici’s Bobbly Straphanger, on show at The Fireplace Gallery. It’s a well known (though redundant) fixture from London tube trains, now attached to the underside of a domestic mantelpiece. Visitors finding BAS7 a bit of a bumpy ride could try hanging on there. Sited in a private residence in Mutley, The Fireplace Gallery opens every Sunday for just a few hours. Proprietors/curators Hannah Jones and Neil Rose have created a rolling show of micro-exhibitions by artists who have previously been their house guests, along with a mini-shop selling artists’ multiples. The Fireplace Gallery follows a tried-and-tested artists’ tactic of using domestic space as art space. You can see it all over the country in open studio events, and elsewhere in the Plymouth Fringe at Sandy Wager’s charming Washing Line Exhibition (does what it says on the label and, like the laundry, doesn’t get hung out if it’s raining). The Fireplace Gallery is different because it adopts many of the formalities of the gallery – boxed-in white space (albeit in miniature, in a fireplace) and vinyl lettering. It’s also publicly funded. If you are ‘the public’ (as opposed to one of Hannah and Neil’s friends), you need to formally invite yourself, then present yourself at a stranger’s door between 3pm and 6pm on a Sunday afternoon. You will then sit on the bottom of the owners’ bed to view the work and, afterwards, talk about it with them and their friends over a cup of tea. It’s all very up close and personal. What redeems this slightly cliquey project for me (apart from the undoubted high quality of the art on show) is its level of self-awareness. This is encapsulated particularly neatly in a forthcoming exhibit (27 Nov and 4th Dec) by Jemma Egan, The Fireplace Gallery Private Members Club (F.G.P.M.C. ), which points at the inherent exclusivity of domestic gallery spaces. That said, the wider Come to Ours portfolio includes projects that explore inclusiveness with equal thoroughness. Would you like this badge? (Low Profile) is sited in a number of the city’s pubs, Plymouth Aural Survey (Neil Rose) maps people’s listening choices as they move around the city streets and Video Takeaway is a reel of artists’ videos shown in local fast-food restaurants. All are as much about helping people to discover Plymouth as discover art – and you don’t need to go anywhere near a gallery to experience them. Not that Come to Ours rejected the traditional gallery model entirely. One of their projects, A Circle, considered how to show live work (or its documentation) in precisely this context. Commissioned works by five artists coalesced around a maritime theme, and featured subjects including scuba diving, fishing and adventuring. Ideas were presented via sculpture, drawing, text, video, sound, drawing and the internet. The curators found themselves with a challenging venue: a brand new shop unit in Millbay. This distinctly corporate environment was, however, a perfect backdrop for Beth Emily Richards’ video of a jumbled motivational speech, Positive Adult Development (P.A.D.). This was created in collaboration with polar explorer and public speaker Antony Jinman, who delivered it to camera with a mixture of confidence and self-consciousness that was toe-curlingly compelling. The venue acted as an interesting counterpoint for other works such as Bryony Gillard’s video of Last Orders, a nightly bell-ringing performance taking place across four Westcountry pubs, and Leah Lovett’s underwater recordings from her work with the Teign Diving Centre Sounding, which sounded positively surreal in the carpeted expanses. Right next door and slightly more at home in its retail unit was The Library of Independent Exchange, a temporary collection of books from independent arts publishers and artists. The sheer quantity of material on show was exciting to contemplate, but I couldn’t work out how to navigate it meaningfully. You could browse but you couldn’t borrow or buy, so a visit became little more than a series of random, if pleasurable, dippings. I hope that the directors – Christopher Green and Mark James – will be able to address this issue for the Library’s next incarnation in 2012. It feels like a wonderful idea that hasn’t quite come into focus. Vessel was one of the few major projects outside the Come to Ours umbrella during the early weeks of the Plymouth Fringe. It was one of the highlights for me, even though it was probably one of the most conventional shows. 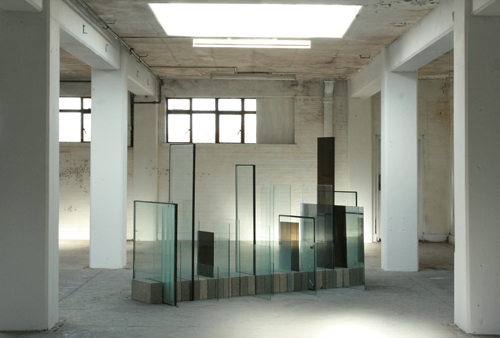 Curated by Carl Slater and Glen Johnston around themes of Plymouth’s trading past, its post-industrial decline and its contemporary regeneration, Vessel presented ambitious, resonant gallery pieces in a huge, dilapidated warehouse space. Made up of work by 17 international artists, its strength was to offer a new perspective on Plymouth by looking far beyond the city for insight. Located in a city with a history of seafaring and warfaring, much of the work referred to borders and territories. Elena Bajo’s The Multiplier Effect was an assemblage of building materials found in and around the gallery. These imposed a reassuring rhythm and order on the deteriorating building. However, a mirror, slipped in among the row of glass and glazed windows, created an unsettling expansion of the work’s limits. The site of the exhibition was also used by Jaeyeon Chung, who sandblasted one of the warehouse’s supporting pillars, surrounded it with ornamental iron fencing and engraved it with the golden text of its title: Nec Plus Ultra (‘go no further’). According to legend, these words were marked on pillars at the end of the world as a warning to sailors. Sandblasting residue spilled out beyond the work’s fenced edges, suggesting any such boundaries might be arbitrary. 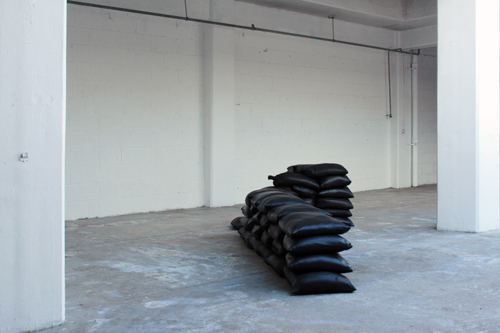 Simona Brinkmann’s Fort Worth #7, a collection of leather-covered sandbags, was poised between suburban comfort and emergency precaution, ready to hold back who knows what. Meanwhile, Clinton de Menezes’ Procession evoked emigration and displacement with its swarm of mucky figurines marching across the walls. Between them, Come to Ours and Vessel provided momentum, structure (and some infrastructure) for the fringe, which helped more short-term, intermittent or improvised activities to thrive. 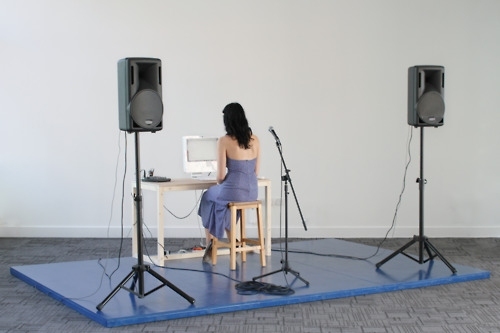 These included Platform P at the Duke (a performance event staged over a weekend later in the BAS7 run), the two-day Plymouth Art Fair, Nomadic Traces and a series of exhibitions at The Pipe, as well as one-off works by individual artists. That said, the pool of active artists and curators in the city is frustratingly small. Come to Ours was an organisation of just seven local art professionals who shared resources (and some commissioned artists) to generate six projects between them. 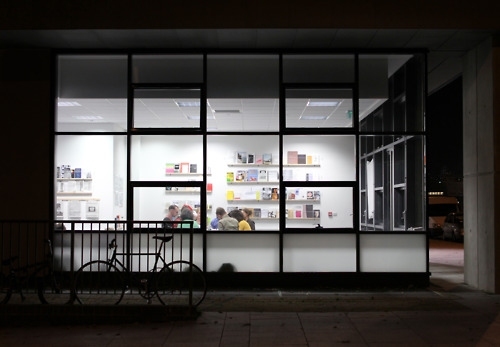 Members of Come to Ours also popped up as associate artists for the Plymouth Visual Arts Consortium, as part of Project Space 11’s mobile programme of events and curating Window Work for DXDX studios. Seeing the same artists’ names repeated across different events invited admiration for their energy and resourcefulness, but also highlighted a difficulty for the city once the British Art Show departs. Artists and independent curators expect to work hard, but this level of effort simply isn’t sustainable in the longer term. And, if people move on – as they must – how strong will their legacy be? British Art Show 7 has offered a welcome boost to artists in Plymouth by improving the city’s credibility as an art destination and by encouraging local audiences to engage with challenging contemporary work. There’s real hope of retaining more graduates from the city’s two art colleges and of maintaining stronger artists’ networks across the Southwest and beyond. It’s true that, once BAS7 leaves town and the fringe is over, there won’t be such intensity of activity and audiences won’t be so easy to find. Also, the quantity of funding and support, paid opportunities and internships is going to diminish drastically. For all that, I believe something important will remain. 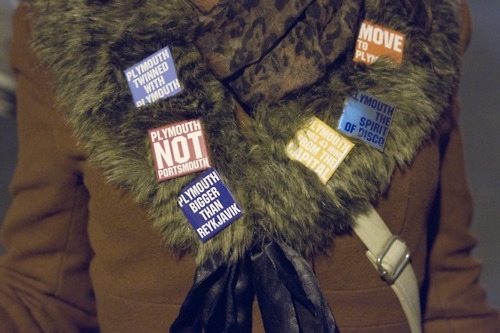 Participation in the fringe has raised aspirations among Plymouth’s community of contemporary practitioners. Once you know what can be done, it’s hard not to keep doing it. British Art Show 7 (Plymouth) and the associated Fringe commenced on 16th September 2011 and continue until 4th December 2011. See http://plymouthbas7.org for more details.